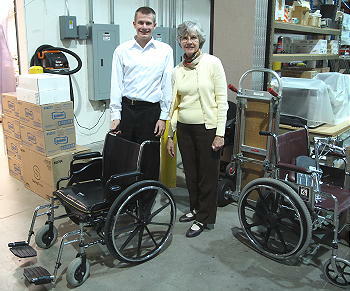 Jeremy Lallier Handcarries Wheel Chair to Kenya - Project complete! One of the greatest joys we have in LifeNets is is when we see the efforts of several people result in a benefit to someone in great need. 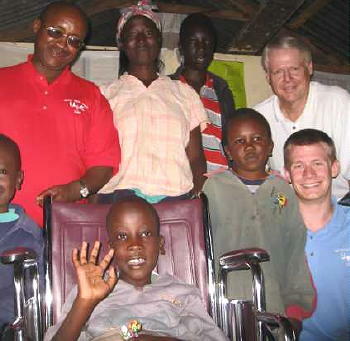 This is one of those stories that involved FINDING a wheelchair, delivering it from Ohio to Kenya to DELIVERY. Jambo Victor from Nairobi, Kenya. The young adults who accompanied me on a three-week trip to hold a summer camp for teens and visit congregations in Western Kenya are preparing to start our flights home tonight. Our final afternoon in Nairobi was highlighted with a visit to the crippled child whose family had requested a wheelchair for him through LifeNets. Antonio Ndung'u forwarded the request from Nairobi to me in Phoenix. It went from there to you in Indianapolis and we asked our traveling companion, Jeremy Lallier in Cincinnati to be its courier. 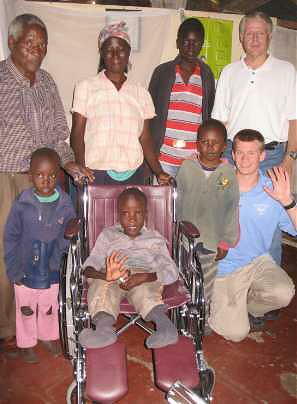 At LifeNets, Alex Kubik procured the wheelchair and got it to Jeremy who took it aboard his Air France flights to Kenya. Today we all helped deliver and present it on behalf of LifeNets to little Edwin Kangethe Ndung'u in Ngong town, which is located just up the road from Karen Blixen's farm featured in the film, "Out of Africa." Here are some photos of the presentation to the happy little boy who received it with enthusiasm. "Thank you very much for this good news. 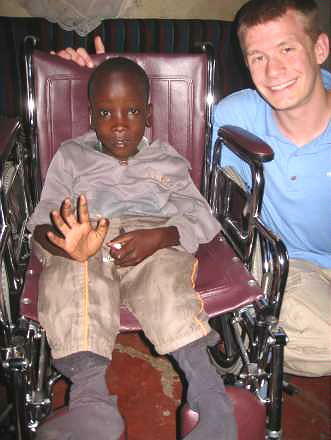 I cannot explain how exited I am for the assistance of a Wheel to this needy young boy. His names are Edwin Ng’ethe Ndung’u and now 10 years old. He was born with a spine problem “[Spina] Bifida” and therefore has no nerve feelings on his lower part of the body. He has been in that condition since childhood. This no doubt means that he cannot stand on his own and has to be lifted to be placed on the Wheel Chair. The boys Parents are in our village but do not attend with United. The wheel chair he is now using is in bad condition and they parents could not afford another one for replacement as they are not finacialy in a position to do so. They have been looking for someone to assist them get another one for over 12 months now and when recently I learned of their plight I was so touched. He attends a school nearby in Class 1 and now will be in position to attend classes on the wheelchair." God's hand has already been so involved with the planning of this trip, but I think being able to provide a wheelchair to someone in need has thus far been the icing on the cake.